Oakland’s First Annual Pride Festival! This year, Oakland will host its First Annual Pride Festival since 2004. Oakland has the third-highest concentration of LGBT people in the nation, only behind San Francisco and Seattle. So why shouldn’t we have our own Pride? There is a lot to be proud of in the East Bay, such as great weather with REAL seasons (i.e. Summer?). Oakland Pride, Inc. (the business behind the festival) recieved a donation from the Port of Oakland in the form of 4,000 square foot office space in Jack London Square. With only a few months to go, fundraising and last minute organizing has been in full swing to make this first festival one to remember and bring hope to continued festivals in the future. Oakland Pride is also serving as the vanguard of a full-fledged fundraising effort to create the first All-Inclusive LGBT Community Center in Oakland in collaboration with City Councilmember, Rebecca Kaplan, the council’s only openly gay member. San Francisco is now trying do what AC Transit has been trying for years… build a Bus Rapid Transit system along one of their busiest traffic corridors: Van Ness Avenue. 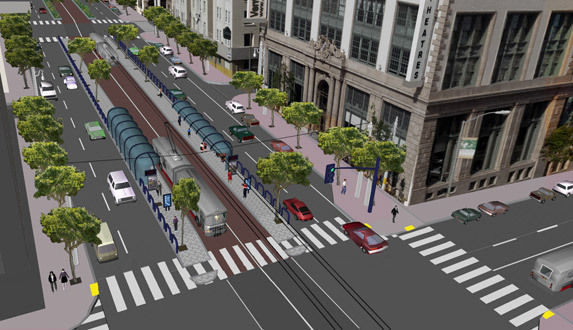 Zennie Abrams’ San Francisco Blog takes a brief look at both BRT on Van Ness and in Berkeley. His point is one that was by many others, including myself. BRT has yet to provide opponents with any tangible evidence that BRT will hurt businesses. Again, I see no example where businesses would be harmed in any way. Indeed, considering Bus traffic congestion along Telegraph Avenue and Shattuck Avenue in Berkeley, BRT’s the perfect solution to improve public transit performance. As far as Berkeley is concerned, Zennie is correct in saying that more education is needed and the Berkeley City Council vote of 4-2-2 is hardly conclusive and there is still a chance to educate the City Council on BRT. In the blog, Living in the O, Joel Ramos calls on supporters in North Oakland to push for better transit so that Berkeley’s decision will not harm those in North Oakland, who would be left out if AC Transit choses to build BRT and leave out Berkeley. BRT supporters who live in North Oakland should see this as a “call to arms” for BRT in the Temescal, which may now be left out of the scope of the project if AC Transit decides not to build anything in Berkeley, and instead opt to turn BRT around at either Macarthur BART or at the Uptown Transit center. To help in that fight, join a group of North Oakland BRT supporters by contacting Joel Ramos of TransForm at joel@TransFormCa.org or contact Councilmember Brunner yourself (jbrunner@oaklandnet.com) and let her know of your continued support for BRT with bike lanes and dedicated lanes in the Temescal. Those living in Berkeley should contact our own City Councilmembers and urge them to support BRT and improve conditions on Telegraph. If you need some talking points, read my previous post on BRT in Berkeley. BRT runs directly through Kriss Worthington’s district and you can contact him atkworthington@cityofberkeley.info. Another Councilmember to contact is Jesse Arreguin, who abstained in the Council’s vote. You can reach Jesse at jarreguin@cityofberkeley.info. Friday Funny: Cut. Print. OWNED! For today’s Friday Funny, we stand in solidarity with our brothers and sisters of the South in Los Angeles shouting “Go California!” Why? In an interview, Wednesday of this week, Arizona Energy Commissioner, Gary Pierce told the local ABC station that his state should cut the power from two plants in Arizona that provide Los Angeles around 25% of their total energy supply. The move is in response to LA City Council’s decision to boycott Arizona over their racial profiling law (aka “Show Me Your Papers” law). “I feel like if you’re going to boycott the candy store, you’ve got to leave all the candy alone,” said Arizona Corporation Commissioner Gary Pierce. Arizona provides 25 percent of Los Angeles’ power. “I feel like Arizona is the candy store,” he added. Pierce made his challenge after the Los Angeles City Council’s 13-1 vote earlier this month to boycott Arizona and Arizona-based businesses. “If they’re really serious about this, then be true to your conviction,” Pierce told ABCNews.com. “I would be happy to help them to renegotiate the power agreements so they no longer receive power from Arizona. When temperatures rise over 100 degrees we’re going to love to have the extra power,” he said. Austin Beutner, General Manager, Los Angeles Department of Water and Power, responded to Mr. Pierce’s comments with some of his own, reminding the over zealous commissioner that Los Angeles actually owns those power plants. “I want to make clear that we support the City position regarding the recent law enacted in Arizona and the resolution adopted by the Los Angeles City Council. On any given day, we receive 20 – 25% of our power from two power plants located in Arizona: Navajo, a coal-fired plant, and Palo Verde, a nuclear plant. We are part owner of both power plants, which are generating assets of the Department. As such, nothing in the City’s resolution is inconsistent with our continuing to receive power from those LADWP-owned assets. This story originally appeared on the blog “Max The Boy Lion 2.0” yesterday, May 20, 2010. Please visit his site and give him props for keeping us entertained on this Friday. I also cross-posted this on the blog East Bay Young Democrats. 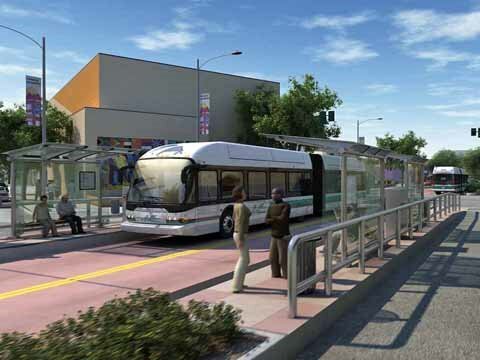 Two Thursdays ago, the Berkeley City Council voted on the Locally Preferred Alternative (LPA) plan for AC Transit’s East Bay Bus Rapid Transit (BRT) project. The Council essentially had three options: 1) “Full Build”, as recommended by the city staff, which would mean dedicated lanes running up Telegraph Avenue and “island” bus stops, where passengers could board the bus in the middle of the road, much like you see in San Francisco on Market Street. 2) A “Reduced Impact Alternative” as prepared by Mayor Bates and other councilmembers, which was a watered down version of the Full Build option, but still included dedicated lanes and islands. 3) A so-called “Rapid Bus Plus” (RBP) option which, in essence, is a no-build option because it removed all dedicated lanes and made no lane reconfigurations on roads. After impassioned, and sometimes theatrical testimony by the public, the Berkeley City Council succumbed to NIMBY pressure and rejected any elements of full-build and endorsed only option three, the so-called, “Rapid Bus Plus” plan. Before I go into the issues of BRT, let me quickly address the importance of the LPA and why you should be upset that Berkeley has practically killed the BRT project for everyone else. In very simplified terms, the way a project like this goes is that AC Transit puts together an Environmental Impact Report (EIR) on how they want the project to run. In this case, they give their preferred route for a BRT system from San Leandro to Oakland to Berkeley. This is then sent to each city for review. Each city then decides what they believe is the best alternative for their city, the LPA.